In a city as old as Athens, digging into the ground is literally uncovering history. When the construction of the Athens Metro began in 1992, the main obstacle facing engineers and construction workers wasn’t digging through rock. Rather, it was having to sift through history in a metropolis that’s over 3,000 years old. During excavations of the 135-kilometre long metro network and the building of its 65 stations, more than 50,000 historical artefacts were discovered buried in the ground: old city walls, parts of an ancient bridge, vases, and even sarcophagi. It was Greece’s biggest excavation programme to date, and over 50 archaeologists were called in to help preserve these ancient findings unearthed during the large-scale project. 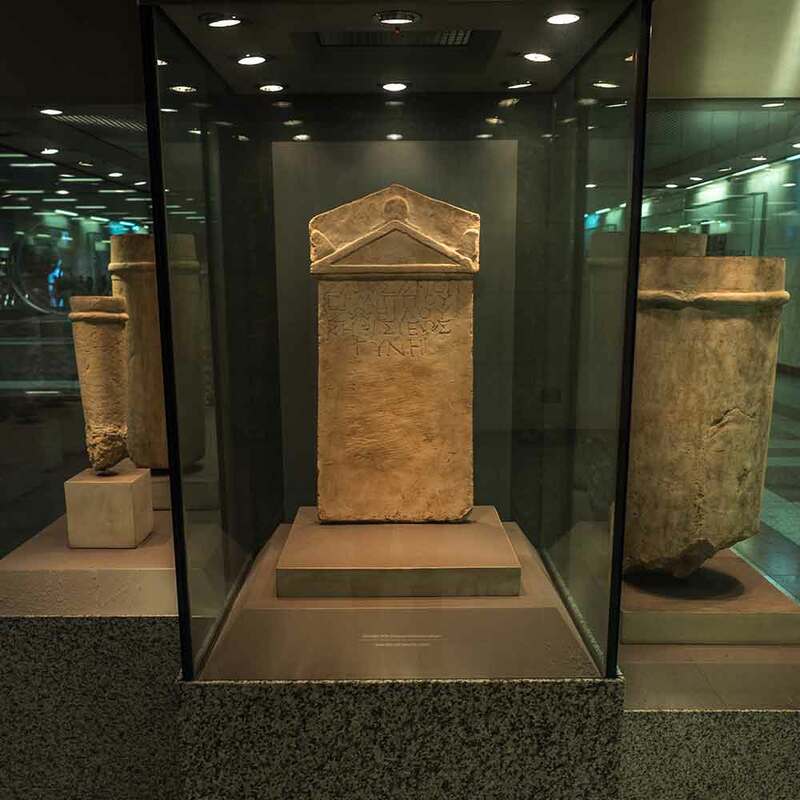 Many of these relics from antiquity are now exhibited in major metro stations across the network and open to the public free of charge, making Athenian metro stations basically underground museums. 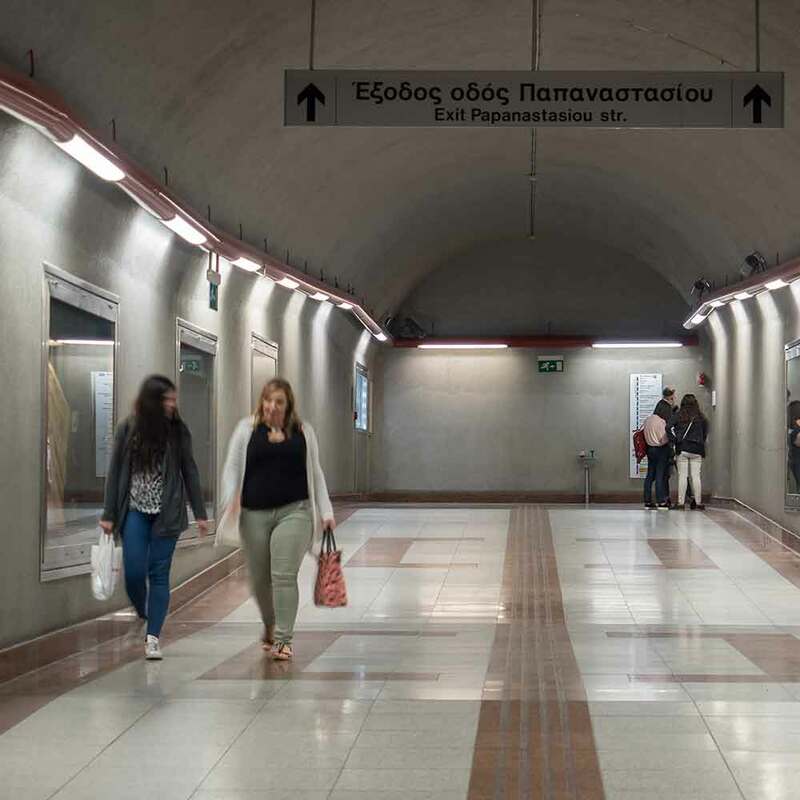 Like many of the stations in the Athens Metro system, Syntagma Station (Lines 2 and 3) is more than just a transit stop. Excavations of the site uncovered sections of clay pipes that were once part of the Athenian water supply and sanitation system. A bath-house complex and a treasure trove of everyday items dating back to 5th century BC, such as vases, mirrors and lamps, were also pulled from the excavation, and many of these discovered artefacts are on display in glass showcases on the top level of the station. The digging also uncovered 35 tombs that were part of an ancient cemetery in the area. Along the wall stands a portion of wall showing the stratigraphy of the site, as well as the skeleton of a young woman who lived in the area more than 2,300 years ago. Also on display is a small section of a mosaic floor belong to an ancient home excavated around the site. At Monastiraki Station (Lines 1 and 3) an excavated part of ancient Athens has been left open for public display. During the construction of the station, archaeologists uncovered the remains of various settlements and buildings which date back to the 8th century BC, including the vaulted ceiling built over the Eridanos River during the time of Hadrian (117 to 138 AD). This ancient river was one of three important sources of water in Attica, which was a historical region that included Athens. A large collection of pottery fragments, dating from classical to Roman to Byzantine times, was also pulled from the private dwellings inside the excavation site: a wall of boards displays the archaeological treasures found in the digging. The area around Monastiraki Station has been in constant use since at least the Mycenaean period (1600 to 1100 BC). Ride the metro to Eleonas station on Line 3 and take the escalator to street level to admire the remains of an ancient bridge discovered below the ground. The three limestone pillars of the old bridge, which date back between the 5th and 6th century BC, once provided safe passage over the Kifissos River. Not only is this structure the oldest bridge ever found in Attica, but it’s also the oldest in all of Greece. Kifissos was widely revered in classical times, and was frequently mentioned by Sophocles in his plays. The garden of Plato’s Academy was also watered by the Kifissos, and it’s depicted on the Parthenon, too. Other significant findings to emerge during the station’s excavation include a handicraft workshops and a cemetery. The exhibits showcased inside Akropoli Station (Line 2) house significant archaeological finds discovered during excavations between 1993 and 1996. For example, graves, houses, a bath complex, and fragments of black and red-figured vessels used in the transportation of wine and olive oil dating from different time periods were found. On the train platform itself, replicas of the Parthenon frieze – created by the great sculptor Pheidias – greet your arrival. As you exit the station, admire replicas of the sculptures that adorned the east pediment of the Parthenon, such as the god Helios on his chariot rising from the waves and Demeter with her daughter Persephone. Digging carried out at Kaloghiron Square during the construction of Dafni Station (Line 2) uncovered the remains of an ancient agricultural settlement, including houses, wells, retaining walls and a garden. 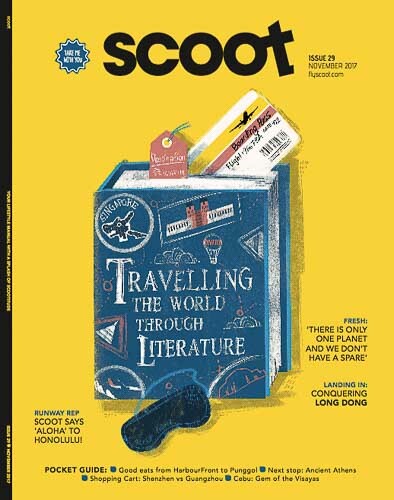 These archaeological discoveries shed new light on the everyday life and activities of the people who lived in the area thousands of years ago. This small farming community was situated on natural bed rock on the north bank of the Kaloghiron stream which springs from the Hymettus mountain and ran open through the area from the prehistoric period until the 1970s when it was filled in. The stratigraphic blueprint of the excavation site – which can be seen behind a glass wall just outside the ticketed area – confirms that human activity has been present in the area since at least the 3rd millennium BC. A collection of artefacts from different time periods were found in excavations of Evangelismos Station (Line 3) which have helped historians piece together a better account of ancient Athens. One of the most important finds were the remains of an ancient water-supply system comprised of clay pipes that contained holes for inspection and maintenance. Interestingly, these pipes, which are dated to the 6th century BC, also contain symbols that are thought to have been used as guides for assembling them correctly. The excavations also uncovered the remains of two rectangular kilns, pottery workshops and an ancient cemetery containing 35 graves and a marble sarcophagus containing a skeleton and a large number of gold-leaf trefoils, gold rings set with gemstones and glass vessels dating from the 1st century. A section of the old water conduit and other relics excavated from the site can be viewed behind glass inside the station. 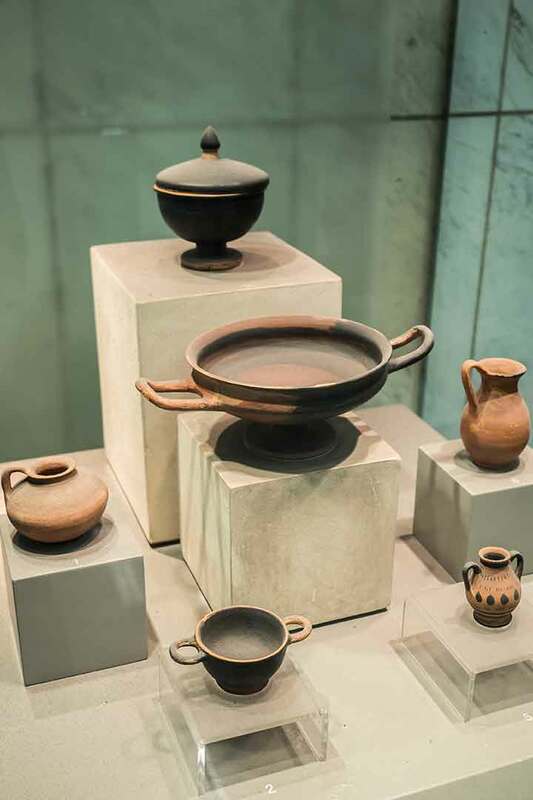 Ride the metro to Egaleo Station (Line 3) and admire an impressive exhibition of 17 showcases which contain excavated relics found during the extension of the metro from Kerameikos to Egaleo. The tunnel drilling, which followed the ancient road Hiera Hodos (Sacred Way), uncovered wells containing ancient objects of everyday use, such as pots, lamps and figurines. Digging beneath the ancient road also uncovered a number of loutrophoroi, which were vessels made out of clay or marble and frequently decorated with relief scenes and inscriptions. These were mainly used in marriage ceremonies, but towards the end of the 5th century BC they were also set up on graves in Athenian cemeteries, especially for those that died unmarried. You can also see a model of a horse’s skeleton believed to have perished in the flooding of the Kifissos River. Today, the metro carries Athenians along the same course, albeit underground – it’s a modern means of transportation following an ancient path. A corridor of glass showcases exhibits an assortment of important archaeological finds excavated during the construction of Panepistimio Station (Line 2) and its surrounding area. Thousands of years ago, this part of Athens lied outside the northeast section of the city walls, which explains the discovery of part of a cemetery: ancient people didn’t like to bury their dead close to home. Hundreds of graves were uncovered during the excavations, dating from classical to Roman times. Amongst the finds were marble and clay tombs, pyre trenches, and coffins, indicating that ancient Athenians both buried and cremated their dead. Many items were also found inside the graves, including bowls, cups, feeding bottles, small basins, wine jugs and figurines. These items were products of Attic workshops during antiquity and of high quality, and many of them are featured as part of the Panepistimiou Station exhibition. An express bus ticket from the airport to Syntagma Station costs €6. The Athens metro consists of three lines: Green (Line 1); Red (Line 2); and Blue (Line 3). On average, the Athens Metro transports 1,353,000 passengers daily. A 24-hour and five-day ticket covering the metro, bus, tram and train costs €4.50 and €9 respectively. The ticket is not valid on any of the Airport Lines. 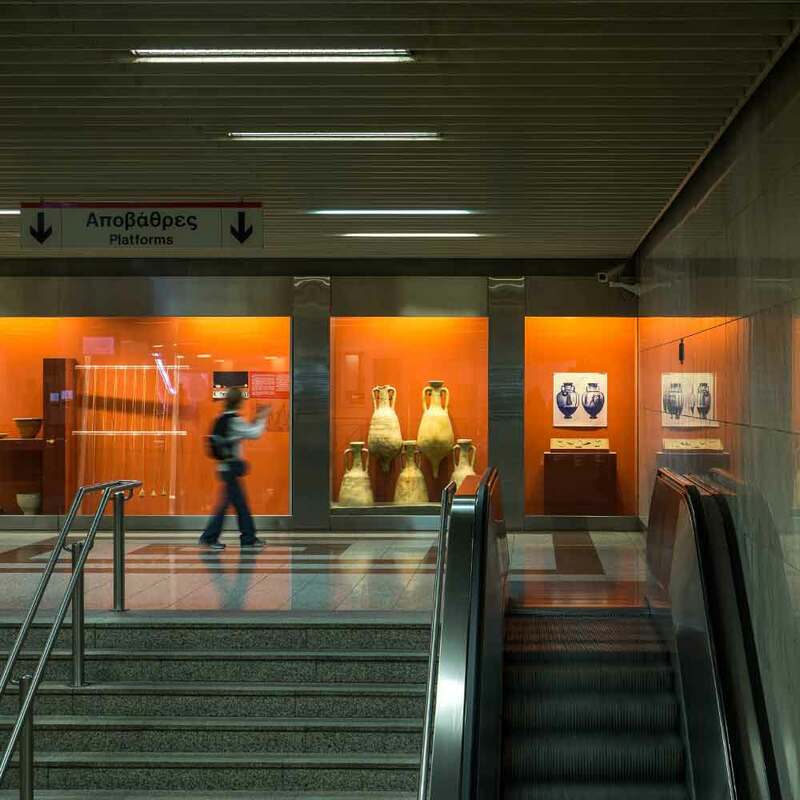 Frommer’s Travel Guide ranked the Athens Metro in the top ten subways of the world in 2015 because of its archaeological exhibitions.